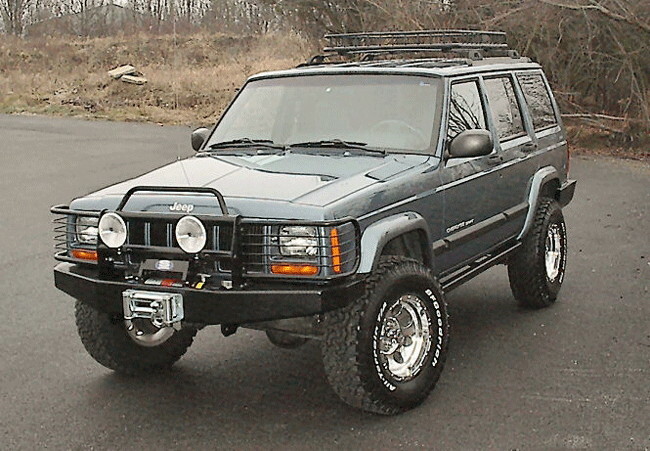 Designed for especially for Warn winches, our tapered winch bumper fits all XJ's, '84-'01. Available options include wrap-around brush guard or prerunner bar, bolt-on shackle mount, and a cover plate if you're not installing a winch right away. All parts are powder-coated black. The corners of this bumper are cut up at an angle for more clearance for tires and rocks, and the outer shell is also made from stronger 3/16" steel for more durability. 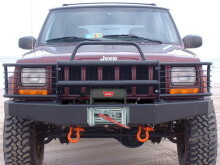 C4x4 Grille guard for XJ winch bumper.